Roll Build Win in this dice-crafting tactical game! Dice City introduces the kingdom of Rolldovia. Each player gets to build on their own large player board featuring 30 beginning buildings. These buildings yield 1 of 3 types of resources; stone, wood, and iron, or 1 army strength value, or 1 victory point. Five buildings will be activated per player each turn. Players each roll a set of 5 different colored dice (white, red, blue, yellow, and black) and place them on their player board with the white die in the white row on the building corresponding to the number rolled. They will do the same for each other colored dice. On their turn, players will collect all the resources triggered by the buildings rolled. Then with these resources they will buy more powerful buildings to place in their city covering up beginning buildings. There are lumber mills to double wood production, quarries to double stone production and mines to double iron production. Also, there are regular army buildings to double military might and other special ability buildings available to acquire. The central marketplace offers a combination of 8 buildings at any time. The object of the game is to score the most points. Some buildings yield points when they are activated by your dice but most will have an end-of-game point value. Victory points can also be gained by using your military might to defeat bandits, or by using your resources to acquire trade ships. The game typically ends when all of the bandits have been killed or 2 of the 3 piles of trade ships have been acquired. There are a couple of things that really make this game cool. 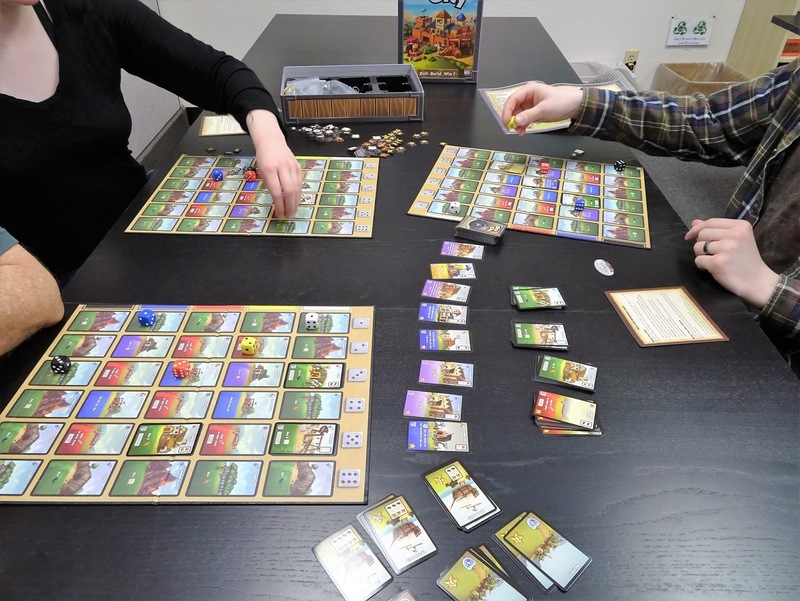 Players can choose which buildings on their board to cover. You are not restricted to covering production buildings with newly acquired production buildings. You can cover resource producing buildings with military or specialty buildings and vice versa. Players can only hold 1 resource of each type at the end of their turn. Players cannot stockpile. This forces players to their resources as efficiently as possible. Players can mitigate less desirable dice rolls by sacrificing a die in one row to move a die in another row 1 space to the right or left. 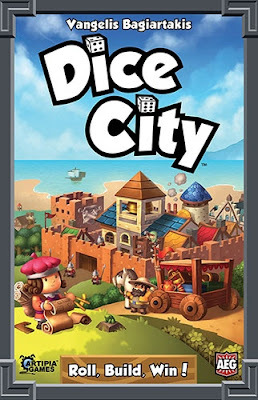 In Dice City, there are several strategies to pursue, a ton of tactical decisions to be mad and ample opportunity to moan and groan about bad dice rolls. We have an open copy of Dice City available in our Demo Games Library for you come in and try.